"Glass Music Ornaments and Gift Bags"
Each December and May, I try to come up with an inexpensive gift for my piano students. These elegant glass ornaments may be my favorites - fast, easy, and cheap. Music (Mine was yellowed with age, which gave it an “antique” look.) Two-sided music (music on the front and back) works best. Cut lines of old music into small strips (one or two measures long or roughly 1 inch wide, 1-2 inches long). Remove the flange from the ornament and pour adhesive into ornament, turning the ornament so that the adhesive runs along all the sides. 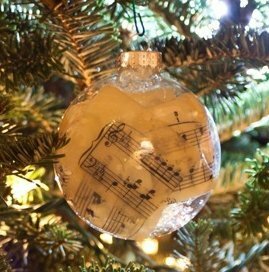 Sprinkle in a little glitter, leaving some of the glass transparent so that the two- sided music can be seen on the inside of the ornament. Put the flange back on and either wrap it as a gift or hang it on your own tree or wreath! I was so thrilled with the way the ornaments turned out that I made ornaments for everyone in the family. For my aunt who is the family genealogist, I glued a color copy of an old family photo on the inside of the ornament and filled it with glitter, feathers (from a pillow), and beads from an old garage sale necklace. For my son who just passed his ham radio test, I glued a copy of his license on the inside of the ornament and then filled it with wires. For my daughter, I used a photograph of her and a friend ice-skating and silvery snowflakes (that I cut from wrapping paper), then I filled it with fun, girly, hot pink feathers, small strips from fabric leftover from her lavender dust ruffle, and purple beads. For cousins with whom we went to the beach last summer, I used a photo from the vacation and filled the bottom third of the ornament with sand. For the photo ornaments, I printed the photos from my computer (the desired size) and then took them to a copy store to have them color copied (on regular computer paper) in water fast ink. (I learned the hard way that the water-soluble ink from my home printer can’t be used for this project.) It was such fun Christmas morning as everyone opened his/her ornament gift, each so different and personalized. Note: Because buying gift bags or small gift boxes would have cost more than the ornaments themselves, I turned brown lunch sacks from the pantry into gift bags; they were the perfect size for the ornaments, wrapped in bubble wrap or tissue paper, and they looked festive. 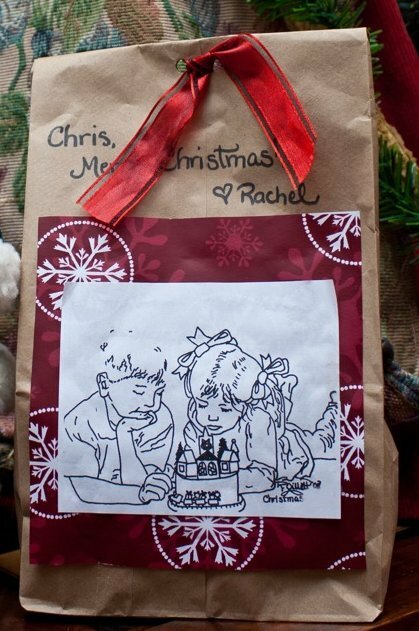 I cut a square out of wrapping paper, glued it to the front of the paper sack, then I glued a smaller square (which was a pen drawing that I sketched of my children, but could be an old Christmas card, any kind of art or greeting printed from the computer, etc. ), and I then punched holes in the top of the bag for a ribbon. Viola!